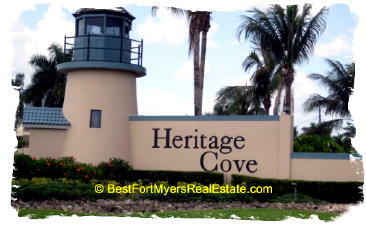 Heritage Cove, Fort Myers, Florida is a single family home fifty five plus community located just off McGregor Boulevard in beautiful South Fort Myers.Search Heritage Cove Homes for sale below. Heritage Cove has 169 single-family homes that range from 1,485 to 1,685 square feet, many of which overlook breathtaking lakes and wooded areas. Great Bass Fishing out your door! These homes have two to three bedrooms along with two bathrooms. The master association, Heritage Cove Community Association, maintains the beautiful common areas. All residents of Heritage Cove pay a quarterly fee to the master association that covers street and landscape maintenance, social activities, clubhouse access, and maintains the charming walking paths. In addition residents pay a quarterly neighborhood fee that includes lawn care, landscaping, and exterior maintenance. Heritage Cove also offers villas and condos. If you need more information about Heritage Cove Homes or other Fort Myers Real Estate, feel free to Contact Shellstar Realty. Our Realtors Have several years experience and can help you obtain the best price on your Heritage Cove Home purchase! Click to view other Fort Myers Communities. or Fort Myers Gated Communities or even Golf Communities in Fort Myers!